Today, Rae Votta has an article, ““Fan Fashion of TV, from ‘Glee’ to ‘Gossip Girl’” on on Tumblr’s editorial site, Storyboard. Super tickling is that she got to ask the costume department about some of the things we talk about here. Short version: the hanky code was not intentional, the death and transformation thing is, and sometimes a sweater vest is just a sweater vest. Additionally, the excellent color theory and character stuff some people have been blogging about is right on. If you’re keeping score, I think that means we can call it a draw, because I’ve certainly always been clear that the sweater vest was likely meaningless from a Doylist standpoint point; from a Watsonian one everything is fair game. Also, let’s remember, analysis isn’t about what we’re told, but what we take in. 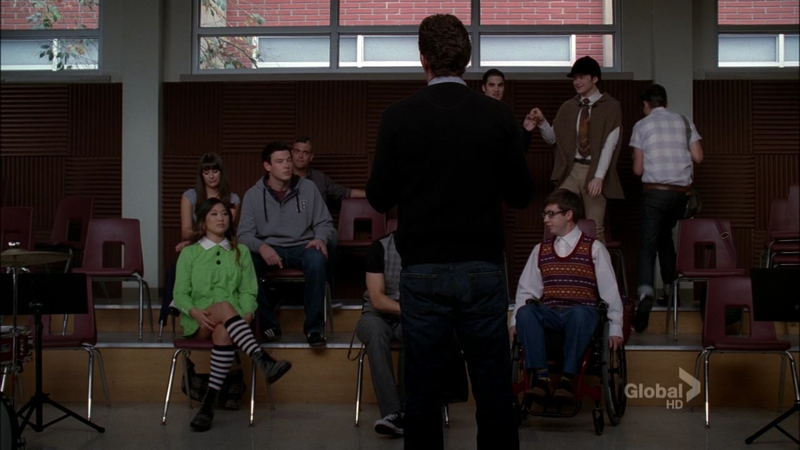 Meanwhile, I will also note, because someone has to, that while I am no fan of conspiracy theories and happy (and grateful) to take Glee’s costume team at its word, if the hanky code were a costuming in-joke in a show about teens that I had any involvement in, I wouldn’t cop to that either. So I think we can keep having plenty of unofficial amusement there. Of course, the real excitement in the piece though (other than some fabulous art that gives a not just to Klaine but to fan favorite non-pairing Faberry), is the costume department admitting there are some in jokes in their choices, but not telling us what they are. My top guesses? Kurt’s equestrian outfit (echoing the polo-related art and trophies in Blaine’s room) and that disaster of a Sunset Boulevard thing with the leather head wrap, both of which got mentioned here back in all the frenzy around “The First Time” when I was talking about Kurt and feminine modesty.